Christmas at a church in New Jersey will look like it did almost a century ago this year, all because the house of worship will celebrate the holiday with a special baby Jesus statue — a statue that was long ago stolen and returned just this past March. In the special nativity scene that will be on display at Our Lady of Grace and St. Joseph in Hoboken, baby Jesus will not be in a crib, but in a card board box as a reminder of where it came and the mystery surrounding it. The story of the long-ago stolen baby Jesus took a turn in March when the church came across the returned statue after an unknown package was delivered to its doors. The statue was found inside, crudely wrapped and with no return address. Rev. Alexander Santora, the church priest, said he was initially apprehensive to open the package since it had no return address and decided to call the Hoboken Police Department to report the suspicious package. With a heat detecting device, the police department's Emergency Service Unit determined that there was nothing incendiary inside and that the package was safe to open, Santora told NBC 4 New York when the statue was first returned. According to Santora, it "was a surprise" when a note and statue were found inside the package that had a tracking number which was ultimately traced back to Crystal Springs, Florida. 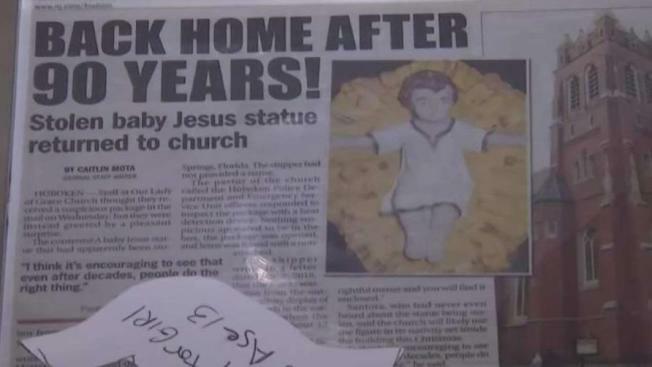 A copy of the note dated Jan. 2, which was originally provided to NBC 4 New York by Santora, said that the baby Jesus statue was stolen from the church’s Nativity display in the early 1930s. According to the sender, the statue somehow came into their grandfather’s possession, and the man never returned it. “Instead, he gave it to my mother after she was married, and she too kept it until her passing when it came to me. Knowing the story, I felt it should be returned to the rightful owner, and you will find it enclosed,” the note read. Santora took the note on good faith and welcomed the Baby Jesus back into the church. Though the parish has been in existence since the 19th century, there is no record of the statue being stolen, according to Santora. However, the plaster statue is made of materials that were commonly used in the area. Santora says that whoever had the statue is forgiven. 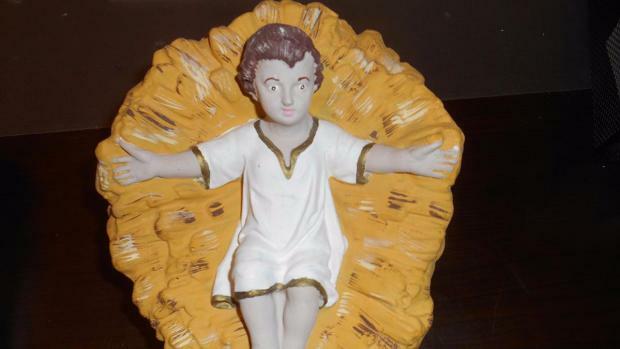 A New Jersey church has been reunited with a baby Jesus statue that it said was stolen eight decades ago. Pat Battle reports. “They owned up to the fact that it wasn’t theirs and even though it was 90 years later, they returned it,” Santora said. 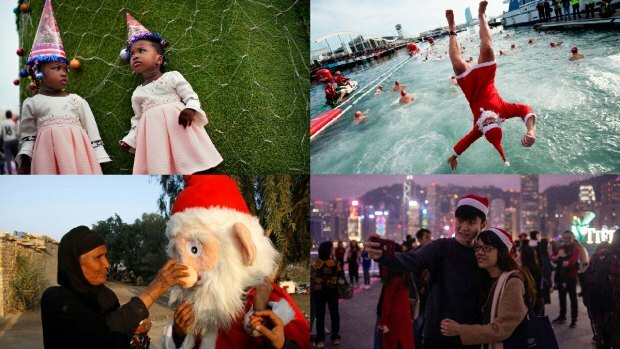 This Christmas, the church will open its doors after a five-year restoration and parishioners will be reminded, when they see baby Jesus in the box where it was returned, that it is never too late to do the right thing. “It is the first time that we can celebrate, not only restoring [the church], but restoring Jesus as well,” Santora said.